Here’s something I never thought I’d be saying: I’m actually excited for a phone made by Palm. Palm hosted a press conference at the Consumer Electronics Show in Las Vegas on Thursday to announce a new mobile phone, which it named the Palm Pre. Prior to the press conference, technology enthusiasts almost unanimously staked the future of Palm the company on the reception they received at CES. Well, from what we’ve seen of the Pre, it looks like they’ll be around for awhile longer. The Pre hardware has the best design and most polish of any previous Palm phone. It’s got a 3.1 inch screen with multi-touch, a physical QWERT keyboard, a 3 megapixel camera, built-in GPS, tons of radios (3G EVDO high-speed internet access, Wi-Fi, Bluetooth), 8GB storage, an accelorometer, proximity sensor, and more. Uniquely, the Pre can also use a wireless charging system named Touchstone. You still need to place the phone on the dock, which magnetically attaches it for charging, but since it’s placed at an angle, it can still be easily used while docked. The Pre’s software is what really excites me. 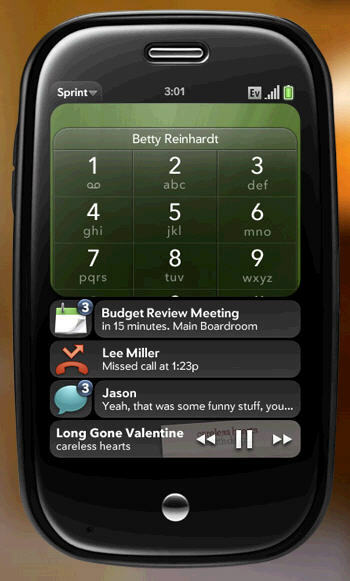 It runs on a Linux-based operating system called WebOS. Much like the iPhone’s operating system, the design is very fluid. There aren’t any jarring transitions between screens – instead, screens shrink, grow, and zoom in and out. The Pre also appears to be the most connected smartphone out there. It features a syncing system called Synergy to keep contacts and calendars synchronized between it and Gmail/Google Calendar, Facebook, and Outlook. Similarly, it has a single inbox for multiple types of messages – email, SMS, Facebook, instant messaging, and others. What it means, in the end, is that the Pre will be much more open than the iPhone and more accessible to developers than the Google Android platform. 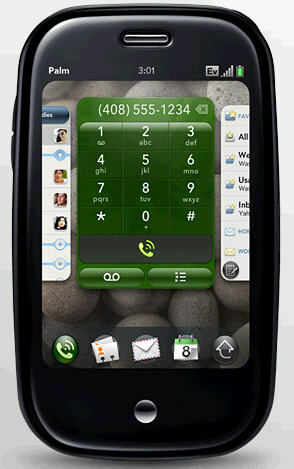 The Palm Pre is going to be available exclusively from Sprint sometime in the first half of 2009. Pricing is unknown at this point, but it’s expected to be comparable to the iPhone ($200-$300 range). Since Sprint and Verizon use similar EVDO/CDMA technology for their networks, it’s much more likely that Verizon will see the Pre available for Verizon long before we ever see the iPhone. If the Pre does make the jump to Verizon, I could easily see this replacing my Blackberry.